After going through the integration process with QuickBooks desktop, you must verify that the integration was successful. You may need to re-integrate a QuickBooks company file that has previously been integrated with SmartVault, or re-integrate if you did not select the proper application integration settings. 1. Open the QuickBooks company file and sign in as an admin in single-user mode. 2. Select Edit > Preferences > Integrated Applications. 3. On the Company Preferences tab, select SmartVault, and then click Remove. 5. Restart the SmartVault desktop software. 6. Restart QuickBooks. 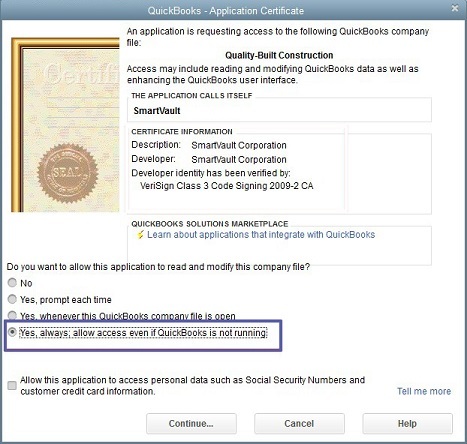 A QuickBooks Certificate window displays. 7. Select Yes, always allow access even if QuickBooks is not running. Note: If this company file is used by multiple users, select Admin in the Login As field. 8. If prompted, sign in to SmartVault using the SmartVault QuickBooks Toolbar.